MAE SAI (THAILAND) - I am standing in the grounds of a Buddhist temple, at the entrance to a dark cave, when I hear a male voice from behind me. "They say that cave goes all the way from Thailand to Myanmar." I turn around to be greeted by a Swiss monk who is living here at Wat Tham Pha Chom, an ancient Thai temple located just 200m from the Ruak River, which forms a natural border between Myanmar and Thailand's Chiang Rai Province. I smile at him and nod. Then I ask my interpreter to check the veracity of this claim with one of the Thai monks. She is able to confirm the story. Or, at least, she confirms it is what many locals believe to be true. Then she relays a warning from a Thai monk not to venture too far inside the cave. People have made this mistake before and got themselves into trouble. This advice was not necessary - I had no intention of exploring the full depths of this cave for a variety of reasons. Chief among them was the lesson learnt via the story of the Wild Boars football team who were saved after 17 days trapped in a cave not far from here last year. Those boys are the reason I'm here. I have travelled to this region called Mae Sai, in the far north of Chiang Rai Province, to report on the re-opening of Tham Luang Forest Park, which closed for nearly five months after the boys went missing in June last year. After completing this report, I want to explore one of the few parts of Thailand which are foreign to me. While living in Thailand on and off for the past six years, I have become familiar with most corners of the country. Yet, until now, I had never visited Mae Sai, a wild region which boasts magnificent mountain scenery, splendid temples, stunning caves and great cultural diversity, with large communities of Thai, Lao, Burmese and Chinese people living side by side. My knowledge of Mae Sai had been limited mostly to what I learnt while watching the coverage of the cave rescue. While ex-Thai Navy Diver Saman Gunan, 37, died during the rescue, the story had a happy ending. The 12 boys and their coach all emerged from the cave safely. 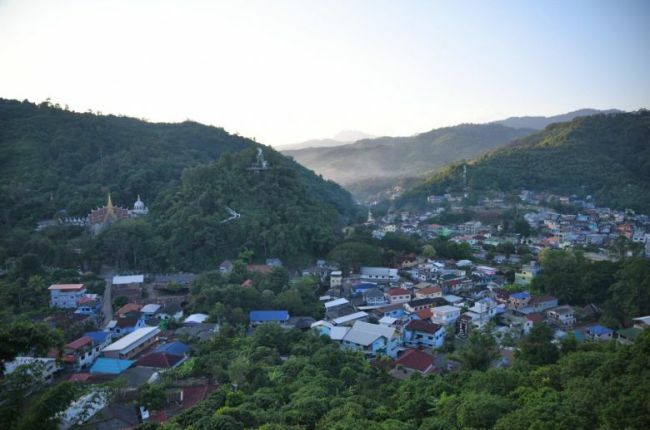 The media coverage of their story has helped embed Mae Sai into the consciousness of many people around the world, resulting in an apparent boost to tourism in the area. On the day I visit the cave rescue site, it is inundated with tourists. I am surrounded by hundreds of visitors, both Thai and foreign. Among them are two Singaporeans. Mrs Viveko Foo, 60, and Mr Bunsiang Lim, 68, tell me they followed the rescue story so closely that they wanted to visit Tham Luang Forest Park, a gorgeous area cloaked in dense jungle. "It is such a beautiful place, I am glad I came here," Mrs Foo says. "Now that it is so famous, I think many more tourists will come". Having finished my interviews at Tham Luang, I am met by a strange and welcome coincidence that evening. As the sun begins to slide from view behind Wat Phra That Doi Wao, about 300m from Wat Tham Pha Chom, I come across the Wild Boars. Decked out in traditional Thai outfits, they are posing for photos as a crowd of excited people begin to form around them. For 10 minutes, they distract me from this gorgeous temple. Also known as the Scorpion Temple, due to its huge statue of this arachnid, Wat Phra That Doi Wao is the main attraction of Mae Sai town, a small but lively settlement which hugs the border. While this hilltop temple is magnificent in its own right, the main reason to visit it is for the sprawling views it offers across the hills into Myanmar. When I lower my gaze, towards the border between these two countries, I am shocked. At first, it is hard to even see where Mae Sai ends and the Burmese town of Tachileik begins. Both towns are built hard up against the Ruak River, which is only about 10m wide here. Looking down at the homes which abut this waterway on either side, it almost seems as if you could leap back and forth across the border from their rooftops. Of course, there is no need for such daring actions as there is heavy and easy movement of people across this border via the bridge checkpoint 200m from Wat Phra That Doi Wao. A flow of people, culture and cuisine has been taking place here for centuries. The Chinese border is just 100km to the north and Laos a mere 20km to the east. Mae Sai is an eclectic place which, while unmistakably Thai, is also heavily influenced by the Burmese, Chinese and Laotians. This much is clear from Mae Sai's varied cuisine. Speaking of which, it is now dinner time and after walking down the hill from Wat Phra That Doi Wao, I am in need of a feed. As I make my way towards Phahonyothin Road, the main thoroughfare of Mae Sai town which is lined with street food, I find myself side-tracked. The route from the temple has taken me through Dao Wow market. Now, as a professional travel journalist, I've been to more markets than my memory can store. But this one grabs me. Because of Mae Sai's location near the borders of four countries, this renowned street market has a huge and varied range of products. Handmade reed pipes from China's Yunnan Province. Silk Longyi dresses from the Shan State of Myanmar. Buddhist wood carvings from Bokeo Province in Laos. Only my ever-increasing hunger stops me from spending hours poring over the delights of this bazaar. I emerge from the market on to Phahonyothin Road to find it cloaked in people and bulging with cuisine. Representing Myanmar is Mohinga, a spicy fish noodle soup. The Lao pork salad dish of Larb also appears popular. I consider sticking to my favourite Thai dish - Khao Soi, a creamy noodle soup from the north of Thailand similar to laksa. Eventually, I decide to go for a wild mushroom hotpot. This speciality of Yunnan has made its way over the Chinese border, down through Myanmar all the way to my table in Mae Sai. This street food area in Mae Sai town encapsulates the cultural diversity which makes this region so beguiling. As much as I adore its untamed scenery, it is the region's unique blend of nationalities that has left the strongest imprint on my memory. If not for the Wild Boars, and the brave men and women who helped rescue them, I may never have come here. Now that I have, and discovered its generous charms, I only hope more people follow. Mae Sai had your attention last year and now, for different reasons, it deserves to keep it. The writer is an Australian journalist and photographer who splits his time between Ireland and Thailand.